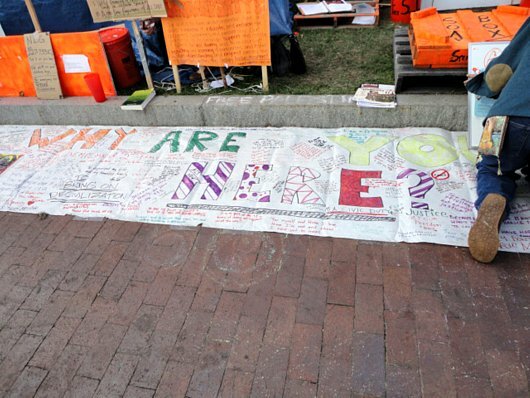 Although the members of Occupy Boston continue to lack one common goal, they share the common ground of Dewey Park Square. This presents a unique opportunity to observe how people actually appropriate public space. How are personal ideals woven into the occupied area that often reveals immediate concerns and pragmatic solutions? 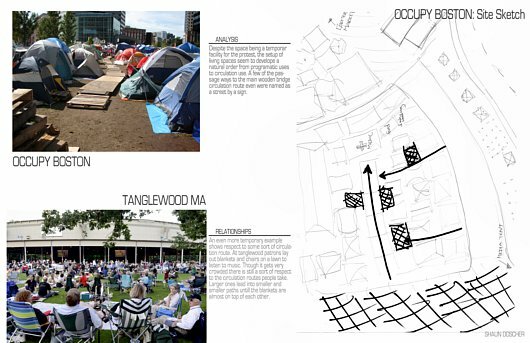 I am currently teaching a course on public space at Wentworth Institute of Technology in Boston, and took advantage of the situation to prompt students to document the spontaneous uses on site at Dewey Park Square, located at the southern tip of the Rose Kennedy Greenway, a series of linear open spaces created after the Big Dig. From the first day of the class, we have explored the relationship between how people use a space, which is often different from how planners, developers and designers intended the space to be used; as stated by Michel de Certeau in The Practice of Everyday Life: We must first analyze its manipulation by users who are not its makers. Image by Amanda Schiffer. See image at full size. Images (left to right) by Caitlin Pandolph, JT Breda, Shirley Ng. 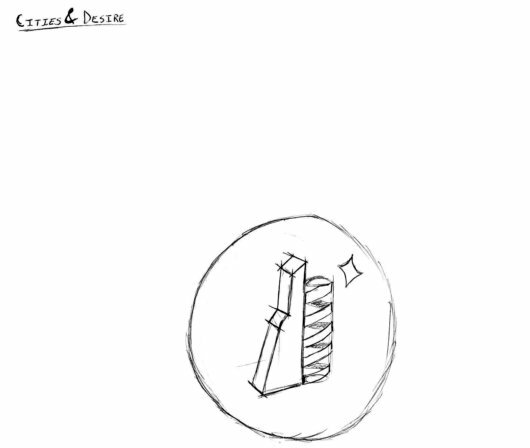 See images at full size. 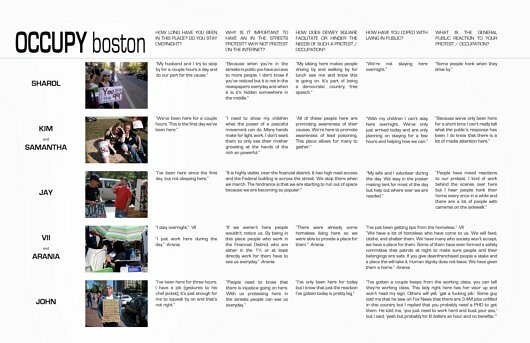 Spatial negotiations: While under occupation, the space continues to be used by people who are not occupiers; photos show space sharing with the weekly farmers’ market. Photos by Ashley Bressette and JT Breada. Social interactions: Even as people are eager to talk with anyone willing, the occupation has a main meeting square. 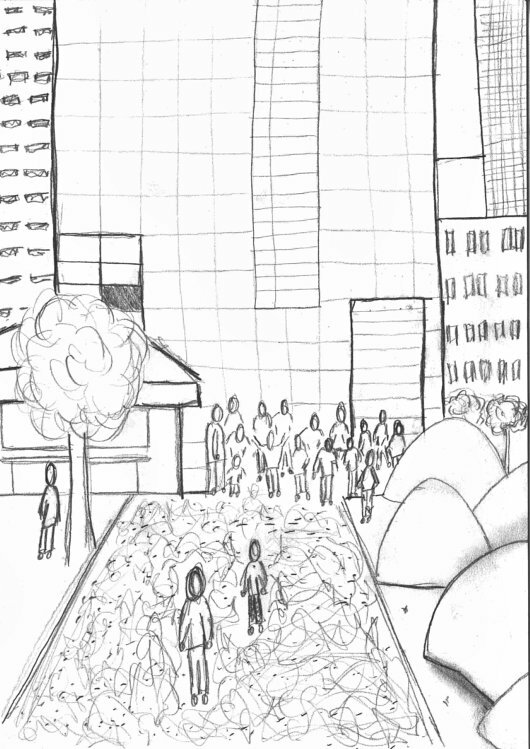 A microcosm: The familiar organization of a city emerges and the occupation is, in fact, a city within a city. 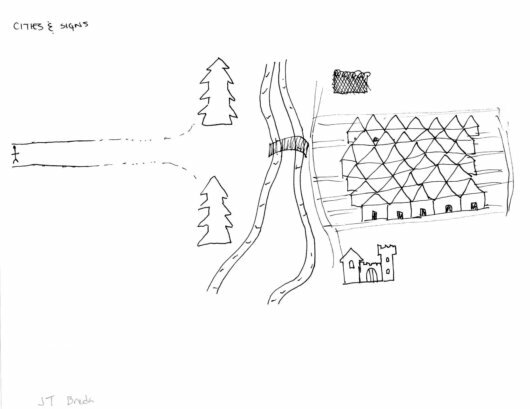 If you study Sophie’s plan, clear circulation leads the way and useful public-use tents are established at corners and other prominent locations. The Logistics and Information Tents mark one of the thresholds into the occupied zone. Other tent-uses include a Library next to the Spirituality and Meditation tent, along one of the main cross streets. 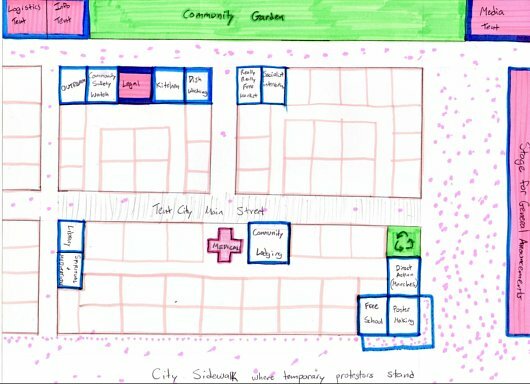 The most pragmatic zones are across from the community garden: kitchen, dishwashing, “free” market and legal. Next to the public meeting space you can find what you need to organize: Free school, Poster Making and Direct Action – Organizing Marches. The resident tents fill in the rest of Tent City. While a different image than our Tent City, the author’s third “Thin City” also titter-totters on a fence, along an uncertain timeline. Perhaps it is telling that Italo Calvino’s famed Invisible Cities so easily comes to mind. In the book, Marco Polo enchants Kublai Khan with stories of cities from the conqueror’s expansive empire. Whether the stories are of fantastical cities or simply facets of one – Venice — is up to the reader. Like in the book, these tent cities are all unique, and yet the same. They are Cities of Desire, Cities of Signs, Cities and Eyes. One day in class, we drew some of these cities too. Cities and Desire by Tyler Moriarty. Cities and Eyes by Amanda Schiffer. Cities and Signs by JT Breda. Claudia, this was a really enlightening post for me. 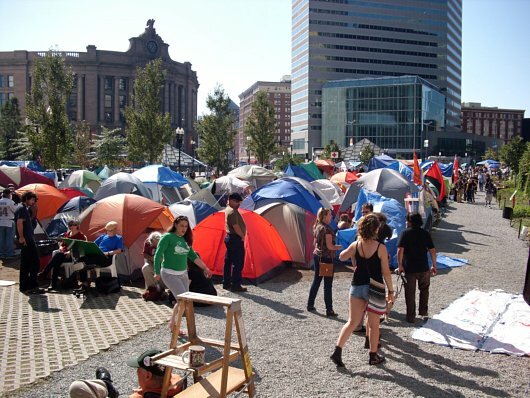 I’ve been to Occupy but hadn’t looked closely at the configuration, despite many formative years of training as an architect. The camp is indeed very organized and I think it was a great exercise to send your students out to uncover the organization that lies beneath what “looks like” chaos to the outside observer. The same order often underlies all informal settlements, but to outsiders, it is not readily apparent. I think it’s interesting to think about how both the physical and social space that Occupy owns have been criticized as “chaotic” by outsiders. Democracy is actually a disorganized but organized process and I think Occupy really demonstrates that in both form and function. Thanks for the comment, Amy. I was also surprised by the strong, simple organization overlaid on Dewey Square. 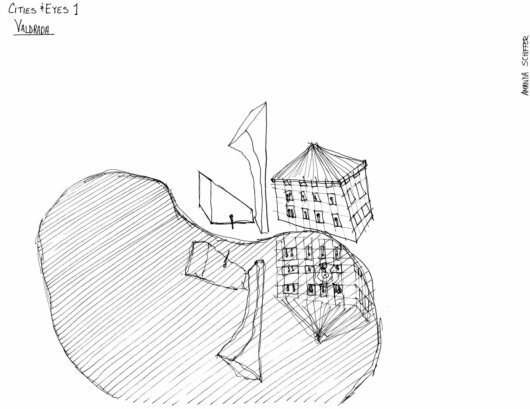 When viewed in plan, it seems neither chaotic nor utopian, but simply functional, even traditional in form.